I'm back with another post. I recently had a bridal trial and we went for a really natural, pretty look. Many of my trials as of late have been on the more dramatic side, so this is a refreshing change of pace. My client is super duper natural. She wears very little makeup and wanted to look polished but still herself. It was helpful because she brought her makeup bag to show me what colors she's typically comfortable with. 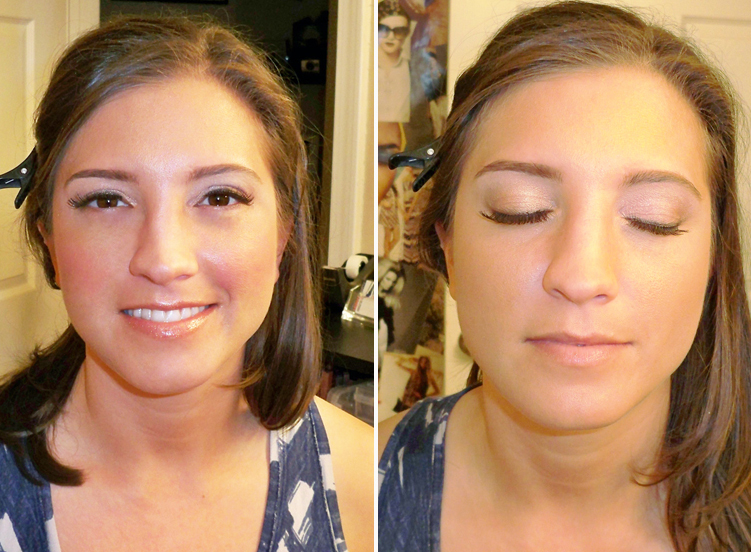 I always recommend that brides do some makeup research so that we can get an idea of what kind of look she'd like. She actually prefers shimmery, metallic colors and wears a lot of Bare Minerals. To keep the makeup fresh I applied light toned eye shadows with a bit of shimmer and smudged the liner for a softer look. False lashes were addeds to give her eyes pop. We stuck to pinky brown on the cheeks and lips to give color but still keep everything on the neutral side. I'll be doing her wedding in June, stay tuned for more pictures! She's so beautiful Ren. You gave her a beautiful natural glow. I love this look, its so naturally beautiful! Twitter 9,000 Followers Giveaway - Skindinavia! What's In My Hair Drawer? What's Inside My Beauty Drawer?